The magazine Karma is entirely different from all this description of publications. Right from the start, our name clearly illustrates the focus of our magazine. Only by having the Kindness with Ardent, Reliability, Magnanimity and Authenticity one can become a good human being. Only by being a good human one can develop the entire human race. Only to contribute to the development of humanity around the world His Holiness Sri Selvam Siddhar is publishing this enlightening magazine KARMA. Normally, magazines make money through their advertisements, paid subscriptions, and purchase price. However, without expecting money from any of these three avenues the magazine Karma is produced. Swamiji Sri Selvam Siddhar brings out this magazine, spending crores and crores of rupees, with his spiritual powers. Always Swamiji is the first in all his affairs. He always scores 100 out of 100 in all. He used to say that, “only the two zeros after the #1 belongs to me and the #1 in the beginning is placed by the Yaksha Devathas. That’s why I score 100 out of 100”. A lot of Swamijis have visited this beautiful country. Out of those many Swamijis, only a few has built temples. Others come here, give lectures, teach yoga or any other yoga related subject, collect money and fly back to their country. It is not that nobody can build a temple. But one should be blessed by the god to build a temple. Swamiji His Holiness Sri Selvam Siddhar is the first blessed person. Only by the blessings all these mysteries are possible. This is purely a mystery by the almighty God. This magazine is not the usual magazine. From cover to cover the magazine has articles. The magazine focuses on rare subjects like Atharva Veda, Eastern Philosophy, Meditation, Spirituality, Vedic Astrology, and many more rare subjects. The book is kept as a treasure by its readers. It is being distributed all over North America. It is found in store fronts, restaurants, grocery stores, natural food shops, waiting rooms, and temples. It is also mailed free to many, many subscribers. Each and every one of us can take part in developing humanity by donating to this non-profit magazine. His Holiness Swamiji Sri Selvam Siddhar does not expect a profit from the magazine, like most other publishers, but rather sees it as the duty of each and every citizen to take part in developing humanity and spirituality. There is no caste, creed, or religious pre-requisite necessary to become a better human being and to practice spirituality. This is the only Indian-American full-color monthly spiritual magazine brought out by a Hindu Temple, without expecting any kind of monetary gain. The advertisements in Karma Magazine are very limited. It is our belief that if a magazine has more and more advertisements, it becomes little more than a yellow pages book. The magazine should be full of useful articles. If the periodical is taken by a person, it should be read by the entire family with devotion. This is the motto of the magazine Karma. Any one can take part in helping to develop humanity and spirituality by contributing useful articles to the Karma Magazine’s editors, as well as through taking a tax-deductible subscription. 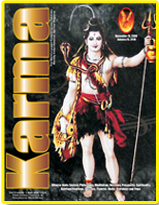 Donations given to the Karma Magazine are donations given towards the development of humanity and spirituality. We might not be able to be as generous as Swamiji Sri Selvam Siddhar, but we can show our gratitude to Swamiji by taking an active part in the development of the magazine. IIn a very short span of time, the magazine’s readership has grown to over 500,000, and has embossed its name in the hearts of all its readers. Most of the readers, so to say 95 percent of the readers keep the magazine in their library as a treasure. The circulation has developed to this great extent, only through the blessings of Almighty God. It may be impossible to see God, but it is possible to see god within the work and shape of blessed souls like Swamiji Sri Selvam Siddhar.